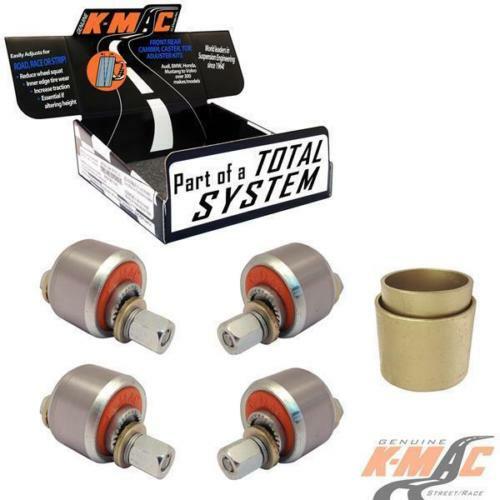 K-MAC Lexus SC 430 (’01-’06) Front Camber and Caster Adjustable bush kit. PRODUCT : Repalces upper arm inner bushes for Camber and Caster adjustment. 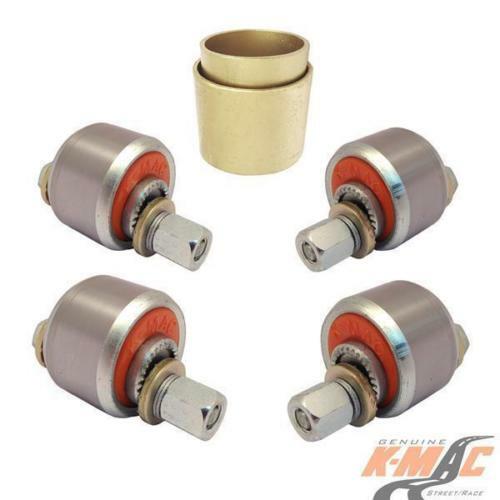 K-MAC have the experience of designing, manufacturing bushes since 1964. So you get what you pay for – it shows with the unique patented design bushings having twice the load bearing area and allowing ‘2 axis’/self-align movement without the use of OEM air voids. RESULT : is improved traction under braking and steering response. Precisely adjustable Camber, Caster and feature single wrench adjustment – accurately (under load) direct on alignment rack. Revolutionizing the industry (no more need for labor intensive disassembly each time to re-position adjustment settings). The Caster bushes resolve steering pull and allow increased positive Caster for improved high speed directional control, quicker turn in and with reduced dive/lift under brake and acceleration. Camber adjustable bushes resolve costly premature edge tire wear and improve traction with tires having more “grip/contact area”. ON TRACK DAYS : Ability to hit those corner apexes every time by being able to dial in extra negative Camber to reduce understeer/increase traction and allowing to go deeper into the corners with again increased traction and also braking response. In the pursuit of lowering lap times and “Front row of the grid” on race days!